Photographs of Falkland Palace Gardens. The domain of Falkland belonged originally to the Crown and was gifted by Malcolm IV to Duncan, sixth Earl of Fife, who married Ada, the king's niece. It remained in this family until 1371, when Isabel, last countess of the line, transferred the estates to Robert Stuart, Earl of Menteith, second son of Robert II, who became sixteenth Earl of Fife, and was afterwards created Duke of Albany. This nobleman was for thirty-four years Regent of Scotland, and resided in the Castle of Falkland. Of this building no trace now remains. In his days the castle received its first historic notoriety, from the tragic fate of David, Duke of Rothesay, eldest son of Robert III. The Duke of Albany early perceived the brilliant promise of the young heir to the throne, and feared lest he should menace his power. Playing on the credulity of the imbecile king, he persuaded him to issue an order for the arrest and confinement of the prince, representing that this was necessary to teach him self-restraint. 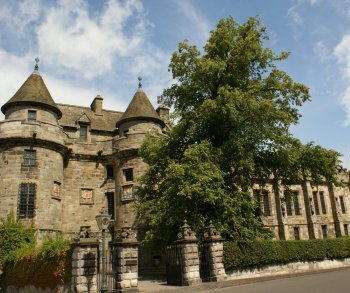 He was inveigled to the castle of Falkland, and imprisoned to die of starvation. His life was prolonged for some time by the compassion of the daughter of the governor, who fed him with small cakes through a crevice of the wall. When she was discovered and murdered by her own father for her merciful kindness, her task was taken up by another tender-hearted woman, a wet-nurse in the governor's family, who supplied the prince with milk from her breasts by means of a long reed, until she too was discovered and put to death. When James I returned from captivity in 1424, Murdoch, son and successor m the Regency of Robert, was executed for treason, and Falkland was forfeited to the Crown. As the estate is well situated in a pleasant valley, at a convenient distance from Edinburgh and Stirling, and was surrounded by forests filled with game, it became a favourite resort of the Stuart kings. The palace was begun by either James III or James IV, and completed by James V. This latter monarch was particularly attached to Falkland, and died of grief here after the rout of Solway Moss. Mary of Guise often lived here, and it was a favourite resort of her daughter, Mary Stuart. Between 1561 and 1566 the latter visited it many times, and found much pleasure here in hunting and other outdoor sports. James VI was also partial to living here, and two attempts on his person, one of them the famous Gowrie conspiracy, were made here. The last monarchs here were Charles I and Charles II, both of whom made short visits. Its last visitor of fame was Rob Roy Macgregor, who took possession and plundered it after the battle of Sheriffmuir in 1715. All that is now left of the original quadrangle is the south side, and a ruinous wall on the east.